In advance of Sensei’s September visit we had a seminar on Sunday July 18, 2010 to explore some elements of Shingon and Shinto daily practice. We culminated the seminar with the short form of the Goma. Please enjoy some video from that ceremony on You Tube. I have had a couple of requests to hold a seminar on Sunday, July 18th. This is a wonderful opportunity to experience the meditations and chanting from our Shingon Tradition. We will share a relaxed casual day of Shingon and Shinto, the traditions behind the goma, as well as delve deeper into the various aspects of the Goma. If you are looking to develop a daily meditation practice, become more involved with the Goma, or are just curious about Japanese spirituality, this is a perfect opportunity. And we are very excited that during the time of the seminar, our Temple carpenter/sculptor – Mr. Adam Bradley will be here from Sacramento California working on some new projects! We hope Adam san will share some of his insights from years of aikido training and experience as the live in shrine assistant for Tsubaki Grand Shrine of America in Washington State – the lineage of our Shinto practices. And there will be plenty of time for Questions and Answers and spontaneity. In the Tendai services and retreats that I have attended, there is a lot of esoteric practice involving (and dedicated to) Fudo Myo-o. What is the significance of this type of practice? Fudo also appears to have the same general attributes in all images and statues – do you know the source of these attributes or why they were chosen? You may want to look at the Fudo Myoo page on the fireceremony site. It explains a bit about Ofudosan. Esoteric practice involving Ofudosan is done to unite with Ofudosan’s energy and essence and to embody same. I don’t know the original source of Ofudosan’s attributes but they are related to his work as the wrathful face of Dainichi Nyorai. This is another magical way of dispersing obstacles. What is your experience performing the Goma? Do the observers/participants experience the same? I have never attended a goma, so this may be an unfair question. The question I have is, I suppose, a question of faith – does Ofudosan act as archetype or actual spiritual entity? If Fudo Myo’o is an archetype, then can any model of person or spiritual being serve in this fashion? What is your experience when conducting an esoteric practice dedicated to Ofudosan? What I found interesting is that those people observing or participating in the ritual (meaning those that agreed to be part of the visualization) can describe the symbolism of the bow, arrow, and some of the movements without having been told. Do you find this in your Goma attendees? What do you mean by “magical”? The actual visualizations which are considered secret so I cannot share them openly with attendees. I have not had anyone share with me experience of the actual practices while observing though people have described some pretty remarkably accurate experiences of seeing the energy move in certain ways that is consistent with the practices within the ritual. Magical, in this case, refers to working with energy. What draws you to esoteric practice? What draws you to Shingon practice? Well I like to be involved. I wouldn’t really be happy in a tradition that only allows me to observe, watch, or ask…so esoteric practices allows me to roll up my sleeves (those robe sleeves sometimes can be pretty bulky! and get actively involved with the energies I’m working with. Shingon – hmmm that was really a karmic connection. I was so lucky to meet Sensei when I was 19 and he shared with me very early on some of the karmic connections and significance of Shingon and myself. I continue to practice Shingon because I really enjoy the union of the personal development internal pieces with some of the more external “in the world” magical aspects. I enjoy the balance of the two and also, I think it’s really important to build a base of purification, compassion, spiritual humility, and understanding of the nature of karma and the nature of self and shingon provides a beautiful way to do this. The necessity of spiritual purification is also a core aspect of the Shinto teachings that I practice and this base of purity is so important to any spiritual work. Rev Tanaka to visit the Goma: Special Goma Sept 11, 2010. Please mark your calendars. I am so happy to announce that my teacher, Rev. Jomyo Tanaka, has given the dates for his September visit to our Goma. This is a truly historic event as the last time Ajari Tanaka was in Connecticut was in 1978; during my birthday, he was taking a bus through CT on a trip across country after having just arrived in the US. Ajari-san will arrive Friday September 10th from Tokyo and depart monday September 13th. We will have a very special Goma on Saturday September 11th. I first met Ajari Tanaka when I was 19 years old and now 13 years later, I am honored and truly shocked to welcome him to visit our goma to see how we are carrying his teachings out into the world. The notion of having Sensei present at the Goma is pretty nerve wracking to be honest but I am so happy he wants to visit us. Stay tuned for more details of the schedule of his visit as it gets closer. Also on Sunday June 6th, we will hold a mini seminar for those interested in learning more of the traditions behind the Goma. We will explore and practice aspects of Shinto and the basic practices of Shingon as well as discuss the history and aspects of the Goma ritual. We will start at 1pm, practice for a few hours, have dinner, and then we will do a special short form of the Goma at sunset. Participants will be invited to sit in the sacred space around the fire altar. This is a perfect opportunity for those who have expressed interest in becoming more deeply involved with the Goma, anyone who would like to develop a core daily spiritual practice, or those who are just curious about Japanese spirituality. If you are interested in attending, please let me know. Finally, we are starting a small group for martial arts training which will be meeting 1-2 times per week. If you are interested in practicing martial arts with us, please contact me. We generally train for around 1.5 to 2 hours and then sometimes we finish with the misogi water purification practice and/or a short form of the Goma. The training includes striking, grappling, body movement and rolling, and use of weapons. First may I thank you for all of your support over the past 2.5 years. It’s been quite a ride – when I met Sensei in 1997 as a teenager I never imagined I would be doing such a thing. In fact, I really believed that it wouldn’t be possible for a non japanese kid to learn such a ritual let alone introduce it to the public and minister to their needs. Well here we are 2.5 years into the Goma and it gets better each month owing in large part to your support. Now I cannot imagine not doing the work that I am doing and some of the stories people have shared with me relative to their profound experiences with the Goma are truly magical. Several people have expressed interest in learning more about the Goma practices and the practices of Shingon and Shinto and so I will schedule a small seminar so that we can explore them in early May. Please stay tuned. Performing the fire ceremony each month requires considerable expense and hard work and I am so thankful for all the support we have received. May I share with you some of our recent expenses? Those are just a snap shot of some of our recent expenses and doesn’t include the cost of building and maintaining the dojo. Currently we average about $100 in donations for each goma so we are covering the cost of the offerings and wood. We have some major projects coming up this spring and summer to prepare for the very special visit of Reverend Tanaka (my teacher) in September. 1) We will build the traditional Japanese Torii sacred gate at the entrance to the space. 2) We will build the Tamagaki traditional fence around the shrine in the dojo. 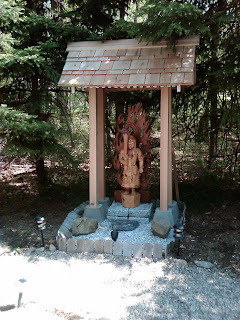 3) We will like to build the temizu-ya “hand-water place” used for purification before entering the sacred space. 4) We are looking at estimates to rebuild the viewing deck…to expand it to allow for more guests. 5) Looking off into the future, we would like to purchase the property for use as a full time Temple and space where many different teachers can teach their arts to others…because we are halfway between Boston and NYC, it is the great location for such a center. I don’t yet have the estimates on these projects but know they won’t be cheap. I feel like it will be easy to do with a little bit of help from the friends and supporters. To that end, if you feel called to assist us with a donation, not only will you generate great karma but we will also have a very special Goma to be offered for the wishes and blessings for each of you who assist. ), cash, checks, etc. This summer we will be incorporating as the 501(c)3 non profit organization which will allow donations to be tax deductible but we haven’t done so yet. Thank you all so much for your help and I look forward to being able to share even more of this wonderful sacred ceremony with you. Each time I login in to the email system, the list has grown. Now we have friends from as far as Australia participating in each Goma. Thank you all for your support! May I welcome you to the Spring Season! The vernal equinox which took place this past Saturday represented the day when the daytime/nightime were equal and our actual and spiritual passing into the spring season. This model is so interesting to study and forms the basis of Chinese medicine/acupuncture. Spring is the season of wood…the element that lends to birth and growth…and feeds fire. Spring time is the natural time to clean (Spring cleaning) and to enjoy the burst of energy that comes with the youth of birth of growth. Come celebrate wood giving birth to fire at this month’s Goma Fire Ceremony which falls on a SUNDAY! Sunday March 28th at 4:30pm. If you wish to inscribe wishes on wood please arrive by 4:30pm. If you wish to only observe the ceremony, we will start at about 5:00. It’s fine to arrive at 5:00 or after if you only wish to observe the ritual. I am so excited to announce that we will have the special guest from Japan attend February Goma. Keita Kunimitsu san, who is the son of Mrs. Tanaka – my teacher’s wife will visit the US and attend the Goma. Keita-san is on business and recently had a baby girl so we are so happy he can visit the US for a few days. In the early part of February, Ofudosama, the main deity of our Goma received a makeover and a new structure was built to house him. Please enjoy the pictures below. We have completed January Goma with the most unusual weather phenomena. The forecast called for mid 40s as it had been all week but we woke up to a magical snowstorm…all in all about 4 inches of snow before the skies became clear just before Goma. Then, just as the Goma was ending we had a blizzard with probably close to 30mph wind, and then magically right after the ceremony, the skies cleared giving way to the 13th day of the new moon which we saw as a bright full moon on a bitter cold night. Our special guest, Mr Adam Bradley, took some time to write of his experiences. Please enjoy his essay and some pictures. If you have never heard of the Goma, it is a traditional Japanese Buddhist fire ceremony that offers practitioners an opportunity release and cleanse unwanted thoughts and habits as well as the chance to offer wishes or prayers for any purpose. I had the unique opportunity to participate for my first time on this 28th of January, Fudo Myo’s day. Preparations were readied for the ceremony early in the day and now the mood was relaxed as the dojo cho arrived on the outdoor deck to greet guests. There were four guests that made the trip from nearby cities on this blistering day to the fairly remote location in the Connecticut woodlands. The forested residence where the Goma is held each month sits adjacent of a two thousand acre state park, a forested wonderland in which the recently fallen snow powdered the hilled topography. A lull in the stormy weather offered an opportunity for guests to enjoy tea and mochi (Japanese rice cake) while preparing wishes on small pine sticks in advance of the ceremony. When my trip was planned two months previously it was suggested we schedule the trip so I could participate in the Goma. But the reason for my trip would be much more than a spiritual vacation. Two years previously I had sculpted a three foot tall Fudo Myo, the main deity of the fire ceremony, from a single piece of western red cedar with a backdrop of flames sculpted from old growth redwood. Since then the combination of weather extremes and sun exposure had deteriorated the wood finish on the outdoor sculpture. So it was decided that a trip should be scheduled to refurbish the wood sculpture and create a more permanent outdoor housing to prevent future damage due to extreme weather conditions. Now the Buddhist Ceremony would begin and the weather still very cold, in the 20s, but the sun still shined brightly through sparse clouds. I took my place at the side of the Goma alter where many small brass dishes filled with variety of food offerings and such. The Dojo cho made his appearance adorned in bright green Japanese robes, readied himself, lit incense and began the incantations to further purify and open a clean space for the Kami/Deity. When the fire was finally struck and the prayer sticks began to burn, the intensity increased exponentially till the chants for Fudyo myo ushered the first climactic event. The sky turned sapphire hues as the sun began to set and clouds rolled in with so many large snow flakes beginning to fall. Earlier in the day we had erected a tarp to provide shelter for just this occasion, and as we would find, it was so good to have it. Now the Ceremony was coming to a close and the incantation of Japanese prayers began again for one last round of fire and offerings. As the sacred fire grew so did the intensity of the weather and dark clouds billowed over the mountain with wind gusts and intense snow to stir our concentration. And then a most unlikely thing occurred, as if conjured by the chanting, a billowing thunder roared over the mountain. Blizzard conditions pursued for what seamed like an eternity and was gone as quickly as it arrived. The fire dimmed and ceased. With all the prayer sticks burned and offerings had, the ceremony was completed. The remaining guests sat persistently by a waning fire and propane heaters, chilled by the blistering cold but very happy to have participated and so was I. We retired to our guests home for tea and warmth to discuss the unique ceremony and events that transpired. Such a neat experience to usher the work that would be completed over the next week. Douglas Adam Bradley is Sculptor in Northern California specializing in wooded statuary. Now we are preparing for the first Goma of 2010 and I am so happy to announce that Mr Adam Bradley of Sacramento, CA is in town. Adam is the master wood sculptor who carved our Fudo Myoo statue and is here refinishing the statue and building the weatherproof housing for it. Please also join us this Thursday at 3:15 pm. If you cannot make the ceremony and would like to make wishes, please email them to me at gomaceremony@gmail.com. Thank you so much everytime! Of course this time of year we are all so busy celebrating the holidays of light at the darkest time of the year with good food, friends, family, and gifts. Whatever holiday you celebrate, please enjoy! And please enjoy all of the pristine freshly fallen snow. I can’t remember the last white Christmas we had in CT. Please also guard your health at this time of year by being sure to cover up the back of your neck and staying warm. The back of the neck houses two important acupuncture points called “gallbladder 20″ or “gate of wind” translated from Chinese. Oriental medicine teaches us that the internal climate is a microcosm of the external climate and as such we are susceptible to invasions by cold wind and dampness. One of the entry points for the cold wind is the back of the neck. From there is travels to the lung which houses the first barrier of protective energy. This is why we sneeze , sniffle, and cough. So please do your best to avoid catching a cold, a wind, or a cold wind by covering up the back of your neck, staying warm, eating healthy warming/yang foods, getting enough sleep, and staying happy. Perhaps the best way to stay warm is attend this month’s Goma. I know it may sound ridiculous but we have two new heaters – one an outdoor wood burning stove and the other a propane heater. That means we will have 3 heaters next weekend. span style=”font-family:arial;”>Our New Years Goma obstacle removing fire ceremony will be held on Sunday December 27th. Please note that we have moved it up one day from the customary 28th so that more people can attend. This is perhaps the most important Goma of the year as it clears away all obstacles to whatever you want/need in the new year. It’s also a wonderful way to boost your new year’s resolutions. So please join us if you can and invite friends. Please arrive by 2pm. May you be filled with brightness going into the new year.